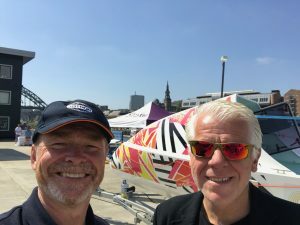 On Friday the 29th June we held our Exhibition at HMS Calliope sponsored by the NE LEP at which we showcased our Atlantic rowing boat and the fabulous innovation attracted to our project from North East businesses, colleges and universities. 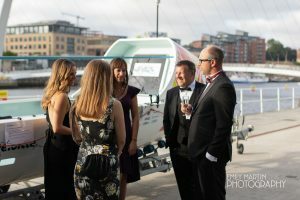 The event also included a business lunch sponsored by Womble Bond Dickinson and an evening cocktail party. 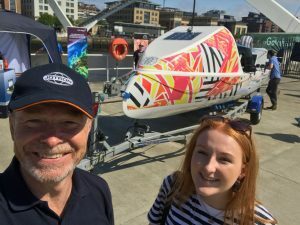 The new livery placed on the Atlantic rowing boat was also unveiled. We had held a competition at Newcastle College at which students were asked to design a look that reflected innovation and the North East. 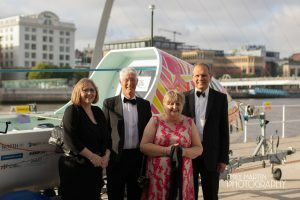 The winning designer was Caitlin Bray and the film wrap was placed on the boat by AAA Signs of Team Valley Gateshead. We were delighted that many of our sponsors were able to attend the exhibition and show case their products and services. 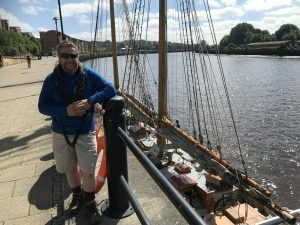 Team Tyne Innovation has been working with North East health and wellbeing company Mammoth, who have supplied custom-made mattresses for the rowing challenge. 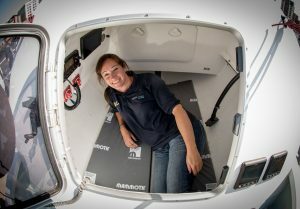 The mattresses, made of Mammoth’s sleep technology, Medical Grade™ Foam, are designed to enhance the crew’s performance by maximising rest and recovery ahead of a rigorous rowing schedule that includes a shift pattern of 2 hour rowing 2 resting and eating, 24 hours per day. 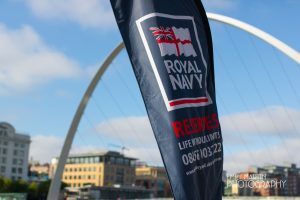 At the event, held at HMS Calliope on the Gateshead Quayside, Mammoth fitted the mattresses into the boat’s cramped cabins and joined the team as they celebrated North East innovation and demonstrated the state-of-the-art items they will take with them on the challenge. Also on show were onesies from The All – in – One Company, the ancestral home of the onesie. The Team have been provided with corporate branded bamboo fibre onesies that will be used for sleeping during the early stages of the event. They are cooling and also have anti bacterial properties which helps prevent them smelling, an excellent property when used in a confined space. 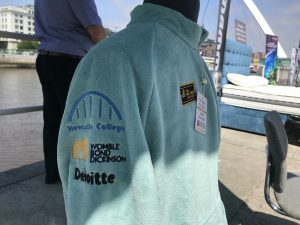 Other sponsors present on the day included Natural Nutrients, Union Rooms, Jotron, Nigel Wright Recruitment, Durham University, Womble Bond Dickinson and Newcastle College all valuable contributors to the the Team Tyne Project. One of our earliest sponsors was Cubix Eyewear and it was great to see the inventor and founder of the business at the exhibition. Ken Smith has been a real supporter of the project and the crew are excited about wear his innovative glasses, that are almost unbreakable. We were also joined by representatives of the three charities that we are supporting being Daft as a Brush Cancer Patient Care, the Stroke Association and St Oswald’s Hospice. 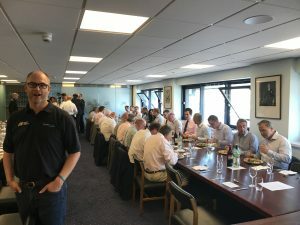 At lunch time we were pleased to host a business lunch sponsored by Womble Bond Dickinson. In attendance were staff and guests of WBD, HSBC, Deloitte, EEF and Mott Macdonald. Guests kindly donated towards the good cause an won prizes donated by Purple Aviation. 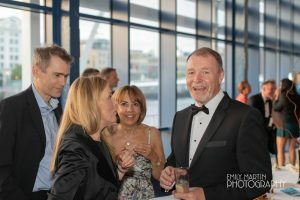 In the evening we held a Cocktail Party at which our sponsors and guests from the wider community attended. 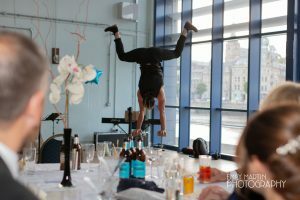 A good night was had by all with entertainment by Menna Jones (pianist), Adam Howells (Singer and Guitarist) and Ross Taylor (Circus Newcastle). Photographs below are by Emily Martin an up and coming photographer based in the North East.